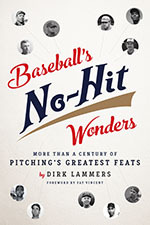 My book, Baseball’s No-Hit Wonders: More than a Century of Pitching’s Greatest Feats (Unbridled Books), debuts in March and is available for preorder. The book honors such legendary pitchers as Cy Young, Bob Feller, Nolan Ryan and Sandy Koufax, while introducing readers to other eccentrics and one-shot wonders who have thrown no-hitters. TODAY ONLY — Use the Amazon coupon code HOLIDAY30 for an extra 30 percent off your preorder!